Join the Sarasota Bay Estuary Program at Oscar Scherer State Park's 27th Annual Earth Day celebration this Saturday! The park is looking for volunteers to assist with planting thousands of plants in the park's lake and wetland restoration areas. Volunteers for the planting may arrive as early as 10 a.m., but the planting will be ongoing throughout the festival. Bay Guardians, wear your t-shirts and come by to say hello to SBEP staff at our outreach table! 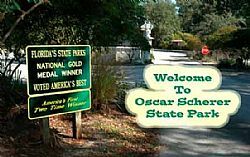 Visit Friends of Oscar Scherer State Park to learn more about the event. When: Saturday, April 23rd, 2016 from 10 a.m.–4 p.m.